The psychological puzzle game Pillar, an exploration of different personality types and their interactions in an "intimate, snowy town," will make its debut on Steam tomorrow. "Pillar is a collection of minigames, where each game represents a different type of personality we find in people. Each personality is expressed entirely through the gameplay mechanics, without cutscenes or dialogue," the Pillar Steam page states. "All too often, we try to change people who are different than us, especially if they're polar opposites. We like to debate and tell them they're wrong and we're right... but what if there's a purpose for both extremes?" Each minigame represents a different personality trait, like introversion or extroversion, and will have to be approached accordingly. "As an example, introverts lose energy being around others, so that part of the game boils down to a stealth formula," Pillar co-creator Michael Hicks explained. "But you can't avoid others completely because you need their help to progress through the level." 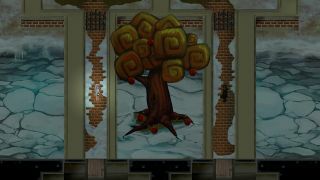 Pillar employs a simplistic, hand-drawn art style, and boasts a soundtrack that's quite lovely as well. It was originally released in February for consoles and on the Humble Store, but the Steam release will also support achievements and Steam trading cards. More information about the game, as well as a link to a free demo, can be found at pillar-game.com.